Don’t forget we offer a lifetime warranty on our installation, as long as you own the car. 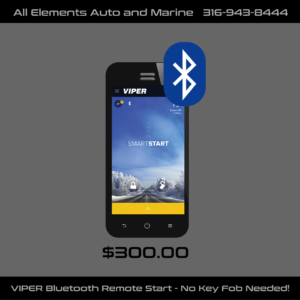 Remote start, lock, or unlock your car from up to 150 feet away via bluetooth. With Viper’s new DS4 technology, smartphone vehicle control capability is built right into your Viper remote start system. No extra interface modules or SmartStart hardware is necessary. Tired of fumbling for keys? SmartStart allows you to remotely unlock and lock your vehicle right from your smartphone. Leaving the grocery store? Open your trunk from up to 150 feet away before you get to your car. Ask us about free smartphone vehicle control and DS4.